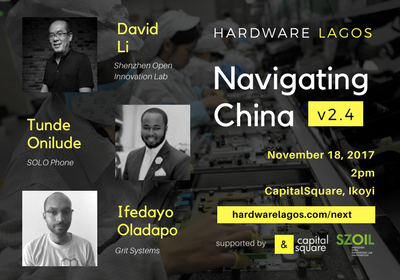 For her seventh meetup, Hardware Lagos explores offshore manufacturing focusing on China. China leads the world currently in manufacturing, with Shenzhen popular for it's consumer electronic markets characterized by it's openness and ease of access. For anyone interested in manufacturing electronics, China is easily the destination of choice for partnerships. David Li is the founder of the Shenzhen Open Innovation Lab(which explores relationships between makers in other hardware ecosystems and Shenzhen) will be introducing us to the Shenzhen ecosystem. After his introduction, we will have a fireside chat between Babatunde Onilude (Product Portfolio and Enterprise Manager, SOLO Phone) and Ifedayo Oladapo (Founder, Grit Systems). Afterwards, the floor will be open for questions and further discussions.